I am in Zambia, Africa - on my first safari, in hopes of seeing big game in their own, natural environment. An alternative to a game drive is to take a walking safari. Does a walking safari mean that you can run into lions?! In a way, it does. So the guide takes us to an area where he feels we are unlikely to run into anything too big or too dangerous. 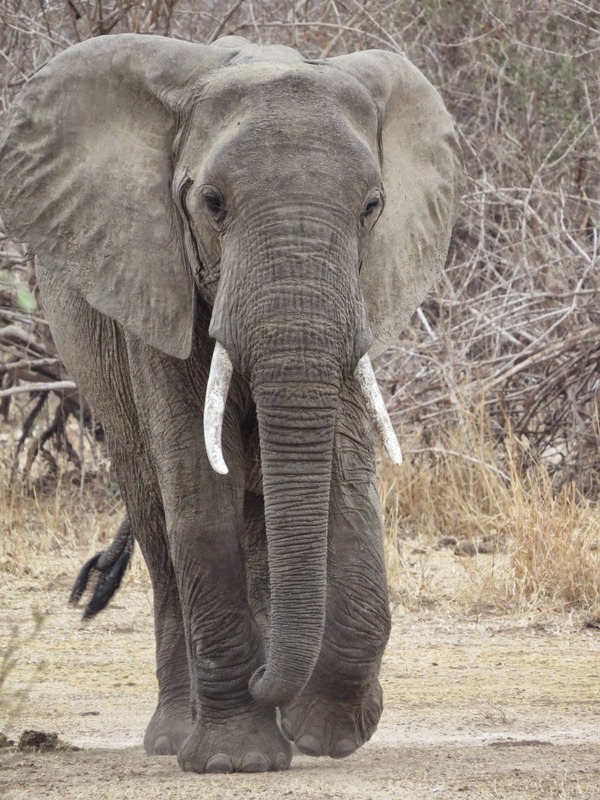 It is not a long, arduous hike, but an interesting stroll through the African bush. The guide reads the ground like the pages of an open book. He also points out where baboons dined on the fibre of elephant dung. We see gorgeous round clay pots, broken open. They are the large balls that a dung beetle rolls through the mud. Our guide shows us intricately woven weaverbird nests that always hang on the west side of a tree. There’s even a bird called a tailorbird that stitches leaves together with real stitches. We follow trails made by elephants and hippos, see a large flock of bright green love birds that look like the leaves of a tree flying off. One afternoon, we have lunch at Track & Trail River Camp. They’ve set a little table for us and when I look up I spot an elephant. Then three more. They come within metres. From the safety of the kitchen door, we watch as they stroll past, right next to the bar. We visit Chipembele Wildlife Centre, an impressive visitors’ centre set up and run by a British couple. They were both police officers in England, obsessed by Africa. Seventeen years ago they moved here, built a house in the bush and now educate African children on the importance of wildlife. On the side, he catches poachers. We found an elephant tusk on the ground. He tells us about one poacher who has just been released from prison. Through some local contacts, we manage to make a date with the guy and spend an afternoon chatting with him. 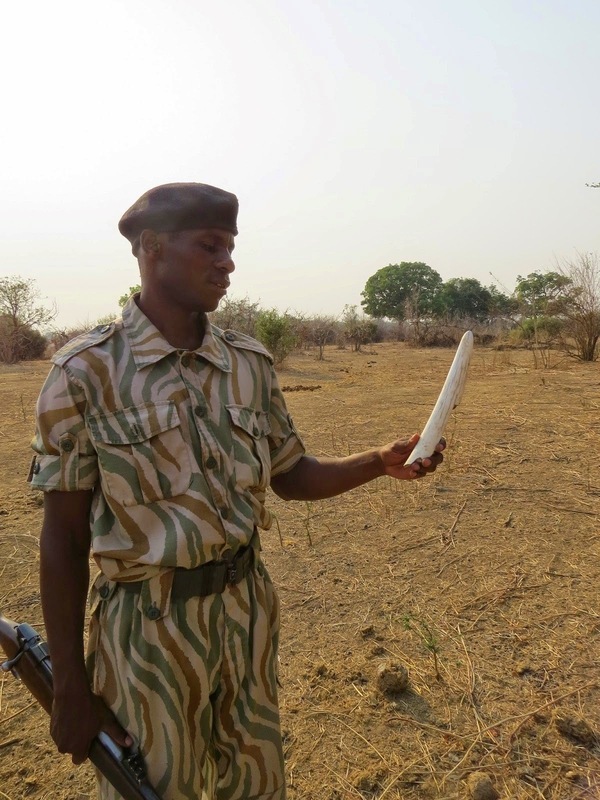 What motivates a poacher? Money. The (ex)poacher has nine children and no job. The 70% unemployment rate in Zambia means no work, no income. So how does a father provide for his family? How does he put food on the table? The easiest way is by poaching. Edwin told us he built his own guns and would spend the night in the bush, hunting impala, buffalo, kudo and more. He ate the meat but mostly sold it. He got caught. At some point he got offered a job but screwed up and went back to poaching. He ended up in jail. Jail in Zambia is not for the faint of heart. “1,500 men in one cell,” he says. People right next to him died of suffocation. One meal a day of a kind of uncooked porridge. It was a wonder that he survived the year. But now he swears he will never poach again. Only time will tell. We hope he will find a job. His skills as a tracker are probably unparalleled. And he now seems to agree: wildlife needs to be protected. Wildlife brings tourists, and tourists bring money. We also understand the problems caused by free roaming wildlife. Herds of elephants trample and eat the crops of corn. They break into grain storage units. Governments try to help villagers by building stronger storage units. 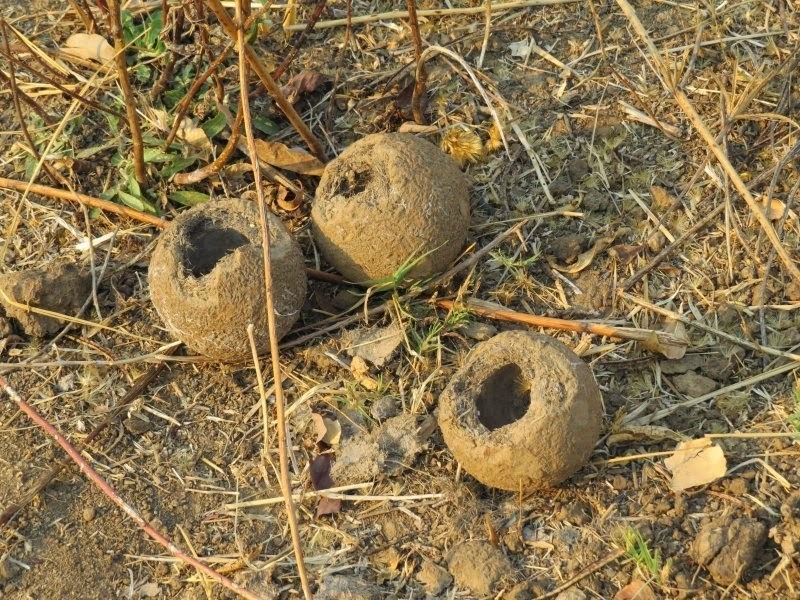 They supply villagers with ‘chili bombs’ and help them to plant chili hedges to discourage elephants. I think about this as I fall asleep to the music of cicadas and the loud ‘snoring’ of hippos just outside our chalet along the river. That night we have the very first rainfall of the new rainy season - the first rain in seven or eight months. It will soon transform the region into a lush green forest with wide rivers and newborn animals. Animals, who will hopefully continue to live in their natural habitat without being brought to the brink of extinction. Any day now—if it ever rains here in Ontario—a most peculiar character will start poking out of the ground in the forest beside my house. The Ghost Plant or Indian Pipes, known as Monotropa uniflora to the scientific community, confuses people every year. No part of it is green, which means it has no chlorophyll, so obviously it's not a plant, right? 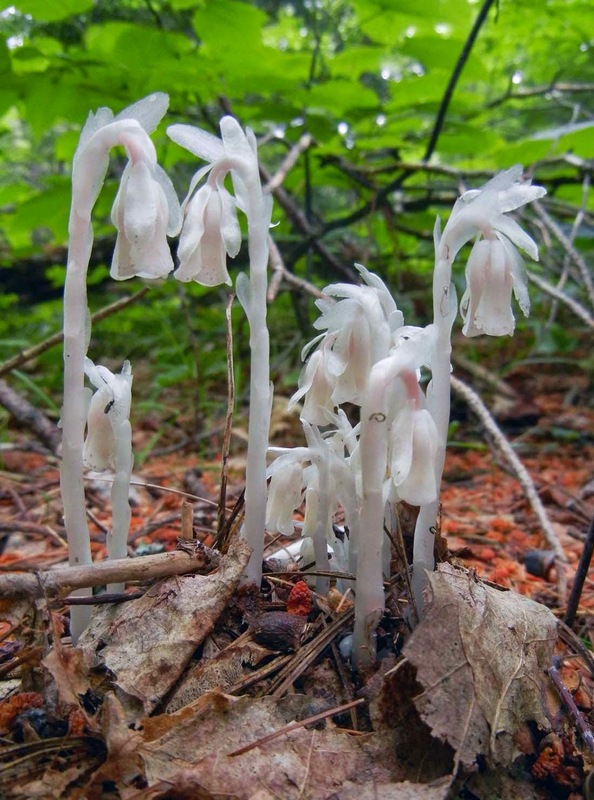 Monotropa uniflora is, indeed a plant, but it has evolved into an entity that no longer needs chlorophyll to produce energy for itself. Instead, it steals energy from other plants—specifically from trees. 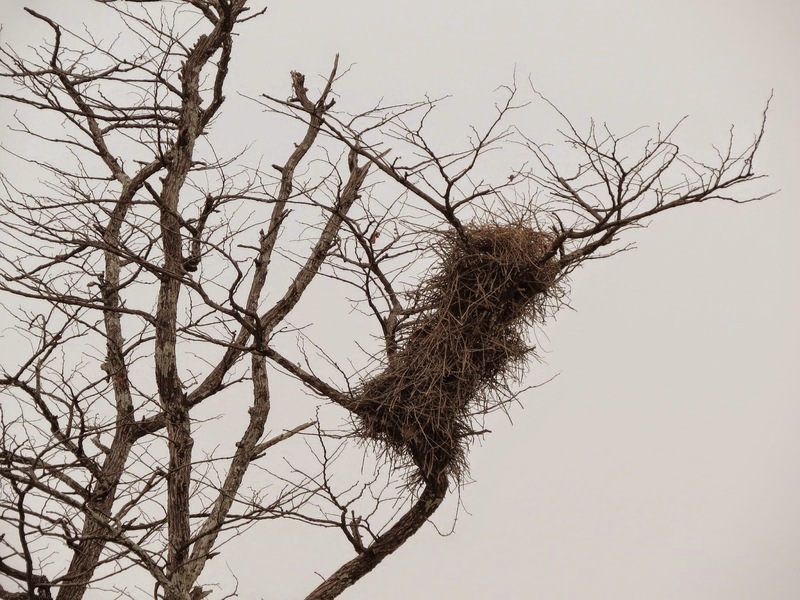 It does this in a tricky, roundabout way by joining its roots with the mycelia of mushrooms that, in turn, are networking symbiotically with the roots of nearby trees. The Ghost Plant is a parasite. The mushrooms involved, are not. This Russula could unwittingly be aiding a parasitic Ghost Plant. 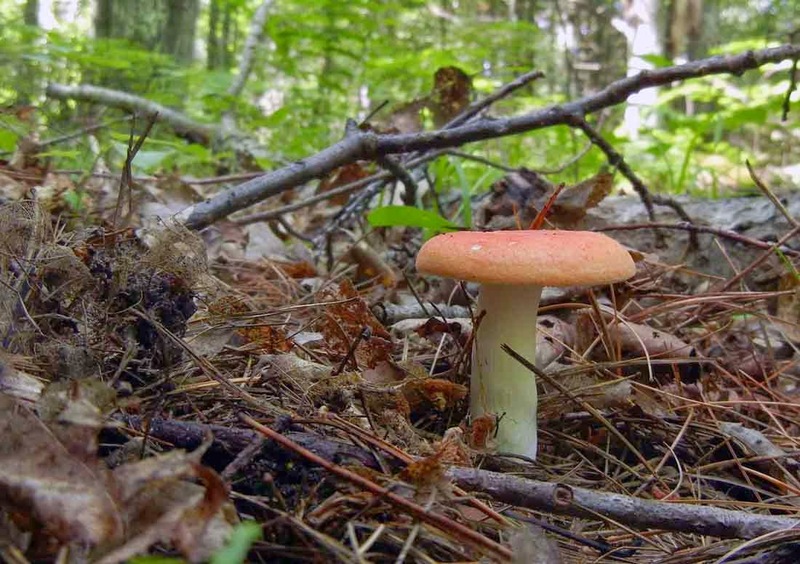 Many species of forest fungi have symbiotic relationships with trees. Their mycelia—networks of root-like threads—intertwine with a tree's roots, helping the tree obtain water and essential minerals from the soil. 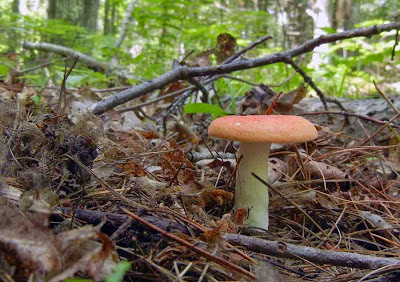 In return, the fungus receives the energy it needs to grow in the form of sugars from the trees. Both parties benefit. 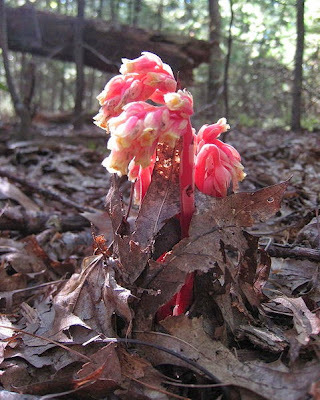 The Ghost Plant, which can't provide food for itself through photosynthesis the way chlorophyll-producing plants can, sneakily takes advantage of the relationship between a mushroom (usually a Russula species) and a tree by tricking the mushroom into forming a mycorrhizal relationship with its own roots. In this way, the Ghost Plant receives photosynthetic energy without doing anything at all. It's a total freeloader. The mushroom gets nothing in return, nor does the tree, but no one is harmed in the process, so feel free to enjoy this spooky looking oddity next time you come across one in the woods. Hooray for the Forest of Reading! I'm gearing up this week for the thrilling celebration of children's books that is Ontario's Forest of Reading. This incredible program, organized by the Ontario Library Association, gives kids from primary school and up the chance to read great contemporary books and vote for their favorites. More than 250,000 readers from all across the province participate annually. Think about it - a quarter of a million kids are reading both voluntarily, and voraciously. So don't tell me kids don't like to read! Silver Birch celebration a few years ago. The luckiest get to attend mammoth award ceremonies - more like rock concerts, complete with screaming fans, paparazzi and authors being swarmed by fans requesting autographs - that are held in Toronto, Thunder Bay, London, and more. As many as 4,000 readaholics can attend one of these events. screaming kids rocked the Hershey Arena! 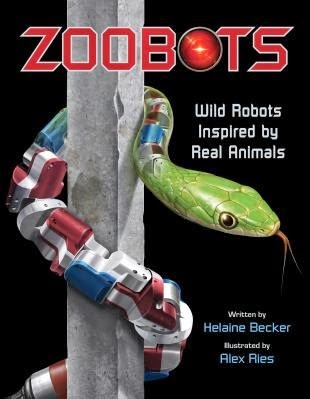 This year, I'm over the moon that my latest science-related title, Zoobots, is a nominee on the Silver Birch nonfiction list, geared for students in grades 4-6. This means that in addition to winding up with a pretty heavy schedule of school presentations, I get to be on stage during each of these award ceremony/celebrations. For authors like me, who are used to sitting at home, alone, most of the year, this onslaught of attention is both overwhelming and exhilarating! It is literally the highlight of my calendar. This is my fifth time lucky enough to participate in the Festival. And lemme tell ya, it never gets old. Be sure to check out all the Forest of Reading lists - they are chock-full of fabulous books! You can find the Silver Birch nonfiction list here and the fiction list here. If you are a parent, teacher or librarian anywhere in Ontario, get the kids you know involved in the Forest of Reading! If you live outside of Ontario, get involved in your own region's children's choice award program. BC, for example, boasts the Red Cedar Awards, and the Atlantic Provinces have the Hackmatack. Saskatchewan, Alberta and Manitoba each have their own programs, as do many American states. If your area does not yet have a children's choice program, contact the OLA and find out how they operate Forest of Reading so you can start a similar program. 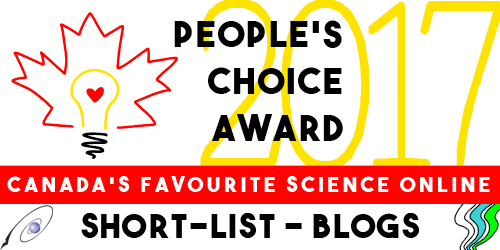 Because children's choice award programs like this one are one of the best ways I know to stimulate a love of reading, build literacy, and encourage engagement with learning. And please wish me luck! I'll need it, if only to survive the crazy, euphoric pace of Silver Birch Season.